Change is good and popcorn is delicious! 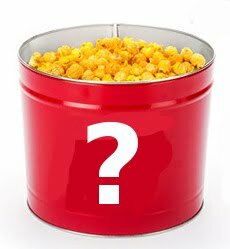 We’ve changed some of the names of our delicious popcorn and you can win some just by guessing the new names to some of your favorite Popcorn Palace flavors! The person who correctly guesses all 10 flavor names wins a bag of each. Thats 10 BAGS OF POPCORN! Five runners up win a bag of each flavor they get right (7 correct answers wins 7 bags, 3 correct answers wins 3 bags, etc.). Grand prize winner will be user to correctly guess all 10 flavors first. Runners up will be judged by number of correct guesses. In the event of a tie, runners up will be decided by time entered. Once notified, winners are responsible for responding with their postal addresses, email addresses and phone numbers (for our shipper). Postal addresses must be submitted within two weeks (fourteen days) of notification. This promotion is in no way sponsored, endorsed or administered by, or associated with, Facebook, Blogger nor Twitter. You understand that you are providing your information to Popcorn Palace and not to Facebook, Twitter nor Blogger. Employees, interns, contractors, vendors, as well as their immediate families, of Popcorn Palace, its affiliates, and any representatives or agencies of Popcorn Palace or other persons professionally connected to the Contest are not eligible to participate. The computer has allowed all types of organizations to elevate traditional marketing approaches and keep organizations on top of minds among donors, volunteers and the community, before, during and after our event.Best of all, many tools are free or require low investment. Whatever you choose, make sure that people stay connected to the organization throughout the year. Post reminders onyour Facebook page. Or create a separate Facebook business page dedicated to your event. Upload photos, post videos, and network! Create a Facebook poll or survey. You never know what kind of interesting information you can discover! Show what your organization does. The stories most likely to inspire action are those that leave feelings or create images in the audience’s mind. Illustrate the benefits your organization provides to the community. Create a blog using Google’s Blogger (it’s free). Have your volunteers, teachers,participants contribute an article pertaining to the fundraising experience. Keep an email contact list (an excel sheet will do!) up to date based upon purchase date & item purchased. This way you can segment your email list and tailor your messages. Email a “Save a Date” for your fundraiser. This allows your recipient to save some funds for your fundraiser and share the information with their social networks. You may receive extra orders! Send a personalized “Thank You” email. Remember this is a bridge to future support. Don’t forget to include a link to your organization’s page!